Taking a break from the State Library of Victoria , I went around the corner to Lonsdale Street for a coffee and baklava. 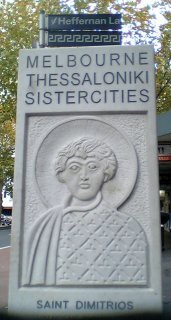 On the footpath at the corner with Heffernan Lane I found a marble stele (pillar) engraved with a relief of Saint Demetrius on the other with Alexander the Great, and the words "Melbourne - Thessaloniki sister cities. From the Prefecture of Thessaloniki during the Psomiadis Administration". This affiliation happened in 1984. but the monument was only unveiled 11 November 2008. Demetrius and Alexander are two of Thessalonik's best known residents; another being Mustafa Kemal Atatürk. I went to the church dedicated to Demetriusis a few blocks away, the birthplace of Atatürk (now in the grounds of the Turkish Embassy) when on a visit to Thessalonik. It is a curious echo to see a reminder in Melbourne.